Among the 18th-century dances surviving in notation are fourteen solos for unnamed female dancers. Who were these solos created for? What sort of choreographies are they? Four of these dances are probably for young girls. Mr Isaac’s Chacone and his Minuet, published in 1711 in Pemberton’s An Essay for the Further Improvement of Dancing, are usually seen as one dance (following Pemberton’s title page) but may have been originally created independently. The anonymous La Cybelline, to music by Charles Fairbank, dates to 1719. Thomas Caverley’s Slow Minuet for a Girl, which shares its title page design with La Cybelline, has been dated to 1729. However, it may have been choreographed before 1720 since there is another version of the dance by Kellom Tomlinson. This was probably written down between 1708 and 1714 when Tomlinson was apprenticed to Caverley. Two solos are from Feuillet’s 1700 Recueil de dances, a collection of his own choreographies. No dancers are named. The Sarabande pour femme, to music by Lully for Le Bourgeois gentilhomme, and the Folie d’espagne pour femme are among the easiest of the dances in Feuillet’s collection. Two of the solos are from the 1704 Recueil de dances, a collection ‘des meillieures Entrées de Ballet de Mr. Pecour’. There is the Sarabande pour une femme, to the same music as Feuillet’s Sarabande pour femme, and the Chacone pour une femme, to music from Lully’s opera Phaéton. Of the six female solos in this collection, only these two have unnamed performers. One solo is from the Nouveau recueil de dance de bal et celle de ballet, choreographies by Pecour published around 1713. The Gigue pour une femme seule non dancée a Lopera, to music from Alcide by Louis Lully and Marin Marais, is the only one of the female solos in this collection that has an unnamed performer. All the others were performed by leading dancers at the Paris Opéra. Turning again to the English choreographies, L’Abbé’s solo Passacaille to music from Lully’s opera Armide followed Isaac’s Chacone and Minuet in Pemberton’s Essay of 1711. It is derived from the duet he had created for the professional dancers Mrs Elford and Mrs Santlow around 1706 (which was not published until about 1725). 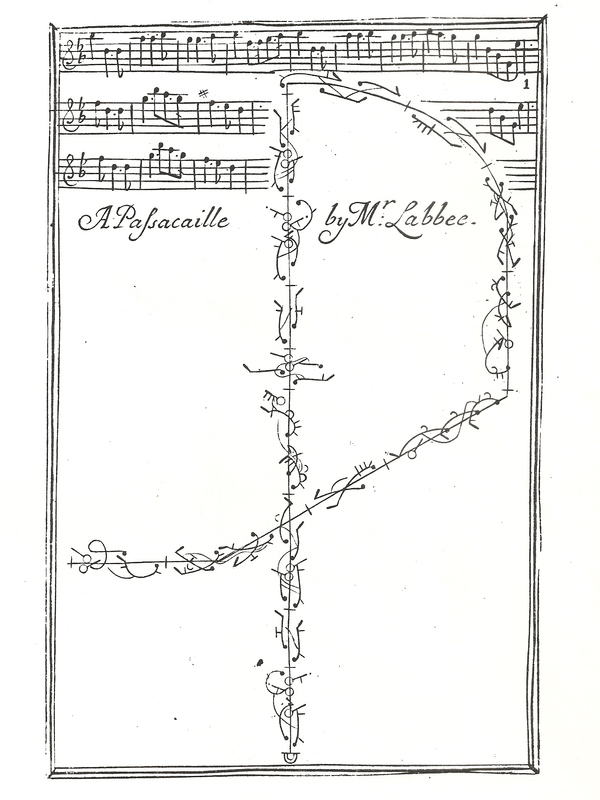 L’Abbé’s Passacaille from Pemberton’s Essay (1711), plate 1. The remaining three solos are all entitled Sarabande and are ascribed to Feuillet. They appear in a manuscript which has been dated to the first decades of the 18th century. The music for one of these dances has not yet been identified, but the other two are from Gatti’s opera Scylla and Colasse’s Polyxène et Pyrrhus respectively. The great majority of dances in this source (24 out of 28) are solos and most are by Feuillet. The status of each of these solos for girls is difficult to determine. They may have been theatrical dances for the stage or display dances for the ballroom. They may have been created for amateurs, apprentice dancers or young professionals. Closer investigation of the choreographies, their music and the sources within which they appear might shed further light on them. This entry was posted in Ballroom Dancing, Dance Treatises & Notations, Stage Dancing and tagged Anthony L’Abbé, Baroque Dance, Edmund Pemberton, Guillaume-Louis Pecour, Mr Isaac, Raoul Auger Feuillet on April 23, 2015 by moiragoff.